We love healthy snacks at our home! Did you know you should eat every 2-3 hours, and so should those kiddos! 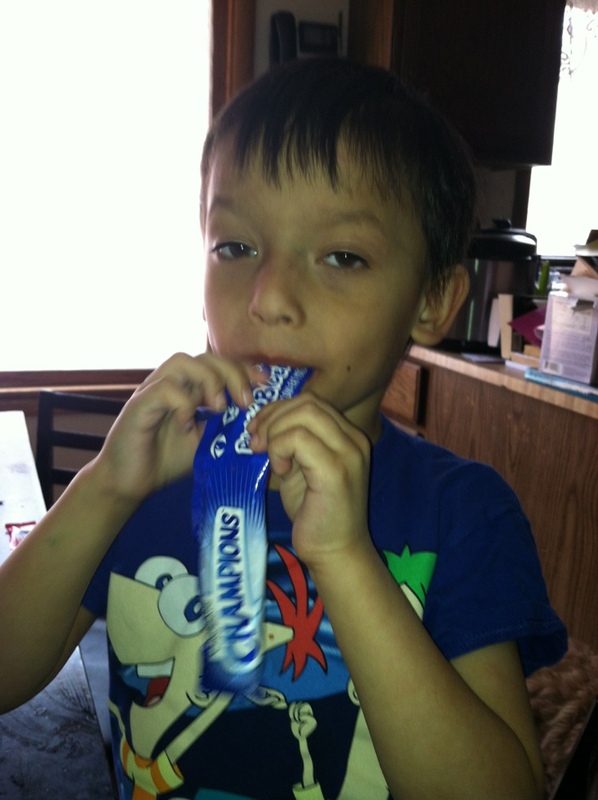 I hate when the kids each junk food, and we LOVED reviewing these Chobani Champions Tubes. Chobani Champions Tubes are filled with delicious flavored Greek Yogurt! And with only 1g total fat per serving, you KNOW you can feel good about them! They also have Vitamin D and deature live cultures (which are good for digestion)! I know what you are thinking, my kids will NOT eat Greek Yogurt! My kids DEVOURED them! Our favorite was the Rockin' Blueberry! 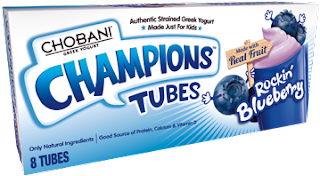 Want to win your own Chobani Champions Tubes. One lucky winner will receive . . . sit down for this one mamas . . .
8 eight-packs of Chobani Champions tubes in assorted flavors! That's right mamas, a total of 64 assorted Chobani Champions tubes! I think freezing them for summertime would make such a GREAT frozen treat! MamaBreak received Chobani Champions tubes to review here on MamaBreak. They did not receive any other kind of compensation. As always, our experiences and opinions are our own. Our favorite would also be Chillin' Cherry; in the cups the Vanilla Chocolate Chunk looks great. Our favorite would be Rockin' Blueberry too! I think I'd love SWIRLIN' STRAWBERRY BANANA, yummo! Chillin Cherry in the tubes sounds great! I would love to try vanilla chocolate chunk. Chillin cherry! That sound the best out of all of them. 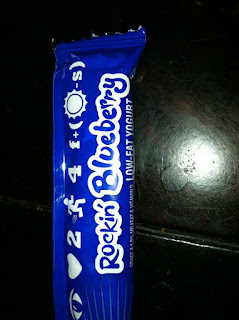 I believe that I will most like the flavor Rockin Blueberry. I'd love the vanilla chocolate chunk! I would love to try the flavor of Rockin Blueberry! The chillin' cherry tubes or the very berry cups. The Vanilla Chocolate Chunk and Chillin Cherry sound yummy! Thank you for the giveaway! I would really love to try Orange Vanilla flavor. I'd love the Swirlin' Strawberry Banana - thank you. I would like "Jammin' Strawberry". I would like Orange Vanilla. I would like Chillin’ Cherry. OH Carter would love the Chillin Cherry! I think I would like the Banana Honey best. My kids would love strawberry banana! Chillin Cherry would be the flavor of choice! Banana honey sounds great- they all do!!! I think I'd like banana honey the best! The Chillin’ Cherry sounds good to me. I think I would like Vanilla Chocolate Chunk. The Vanilla Chocolate Chunk in the cups sounds awesome!